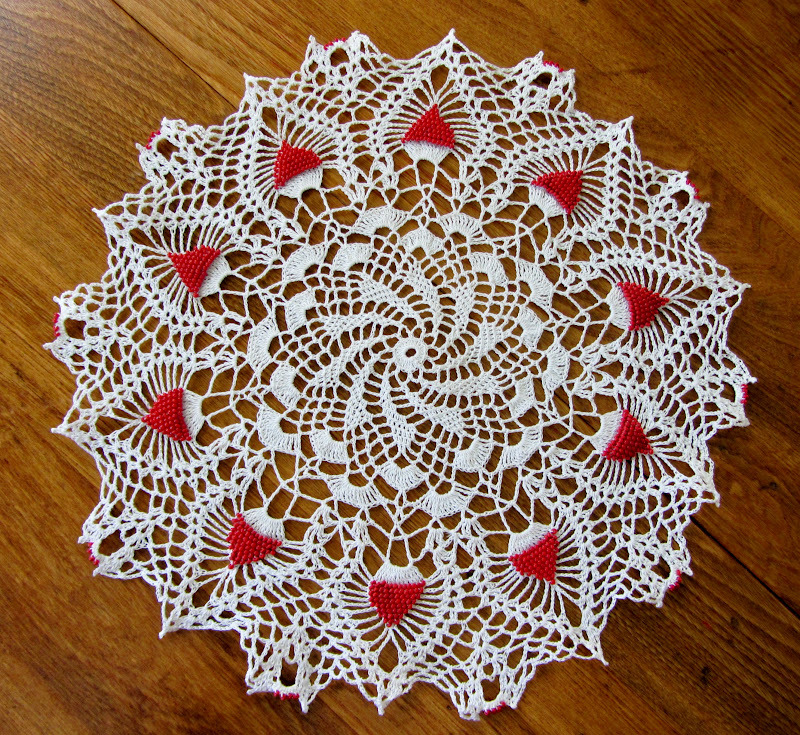 I'm sure not all of you share my love of the doily. To some, the doily kind of says "Grandma's House". I think my style is influenced by English and French Country, Cottage, Romantic, Primitive, Victorian, and American Country, and a little bit of "Grandma's House". I don't combine all of these styles in each room, but have different rooms in my cookie cutter, 1950's rambler, that lean toward one or more of these influences. 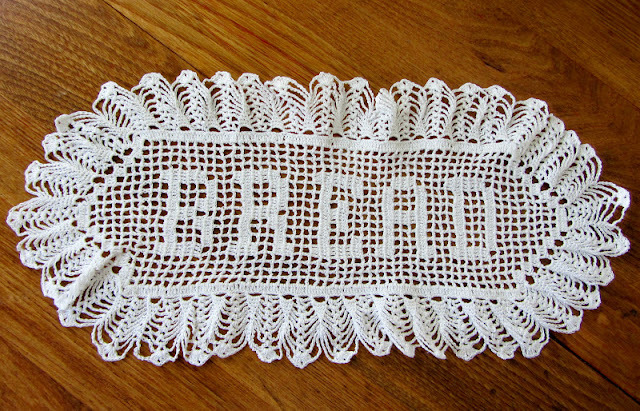 This one is not colored but has a filet crochet word "bread" and an unusal shape. 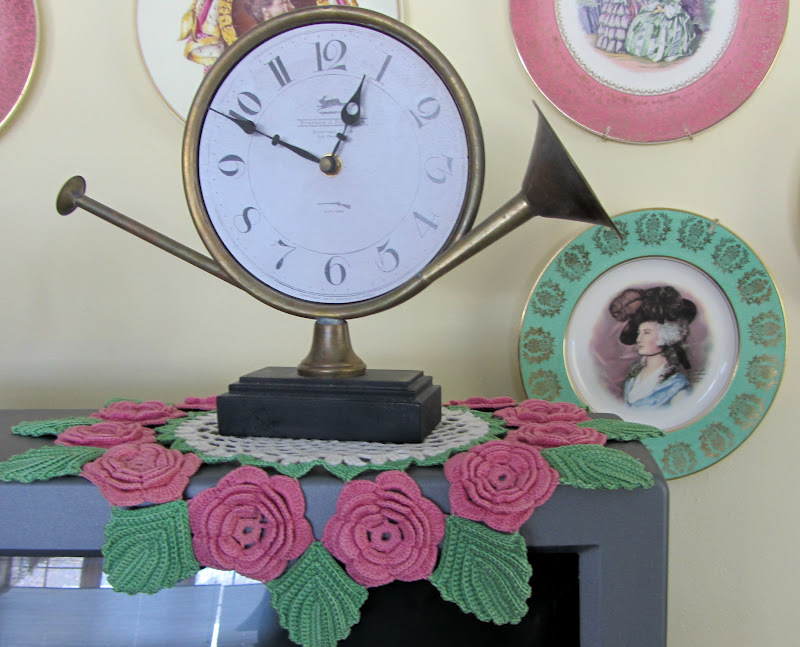 I have had one of these mauve flowered doilies under this clock on my tv for quite a few years. (I have 5 tvs and only 2 have been replaced with flat tvs so far) I will have to find a new place for it when this tv dies! My son and my husband have complained from time to time about the leaves on this doily covering the score of the Vikings game. How do you feel about doilies? 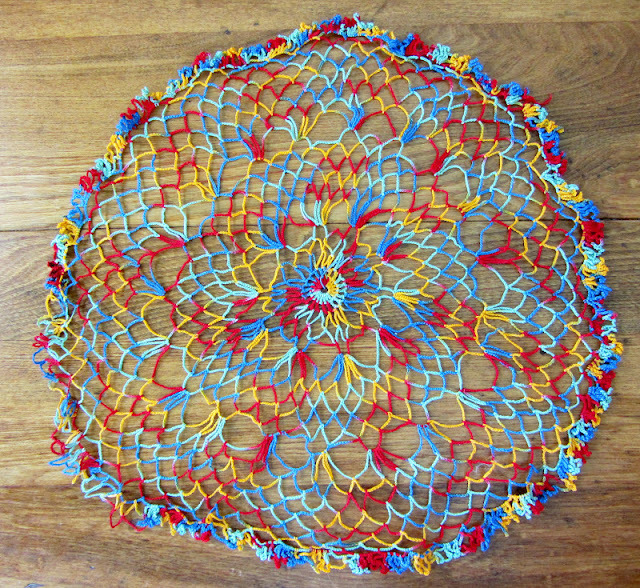 Have you ever crocheted one? I have crocheted one, but just one! 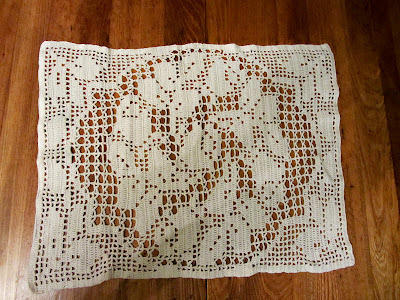 This is the ONE doily that I crocheted over 30 years ago. It's filet crochet. 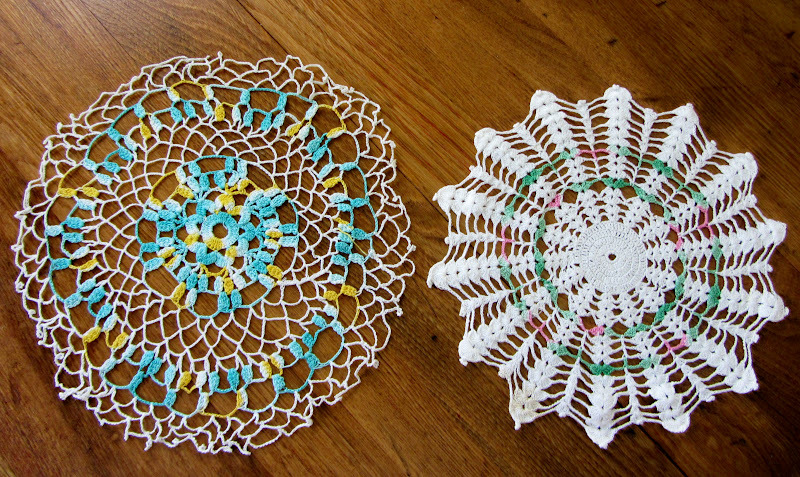 Your doilies are super cute, you have taken the boring doily to a whole different level. I do like to crochet an edge on my towels, to make them pretty. 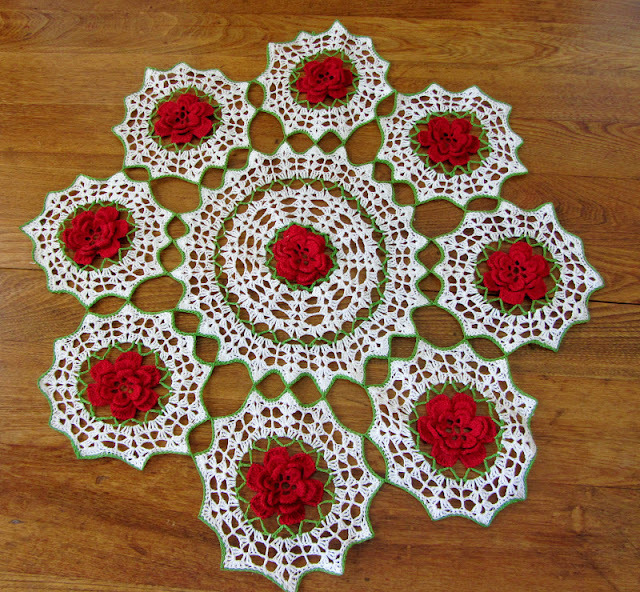 I did not crochet these doilies, just love them and own them! I love them. My daughter and DIL make fun of them. I still use them. Mine are all plain. I love yours. On another note we have one TV.......flat screen we got last year when our other one got so dark we couldn't see the screen. I used my Christmas money and saved up. We also only have one phone.....but there are only 2 of us. 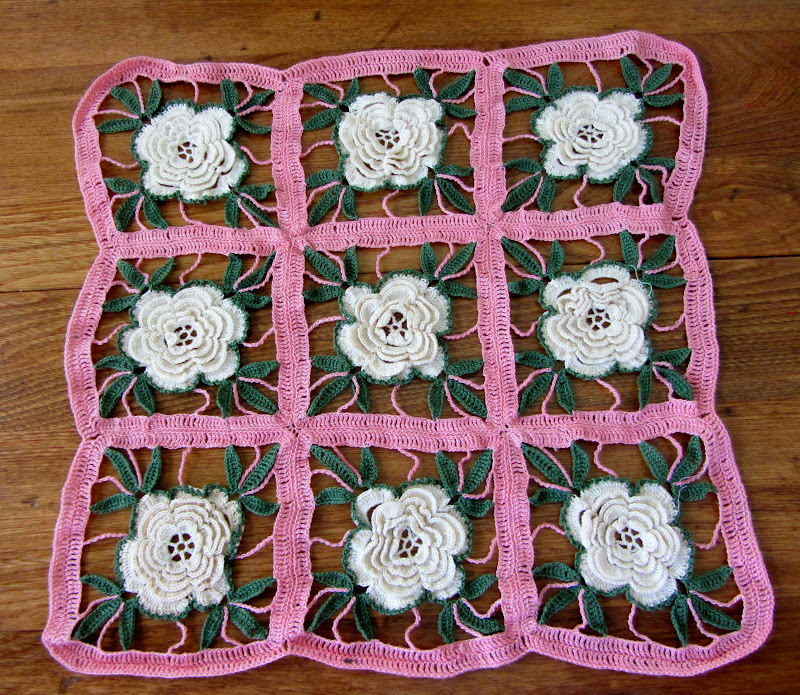 I really want to earn how to crochet. It would be fun to make some. I came over from Show Off Your Cottage and glad I did, sweetpea. I love those doilies. I use them around my house also. They remind me of my grandmother. Nice to meet you, sugar. 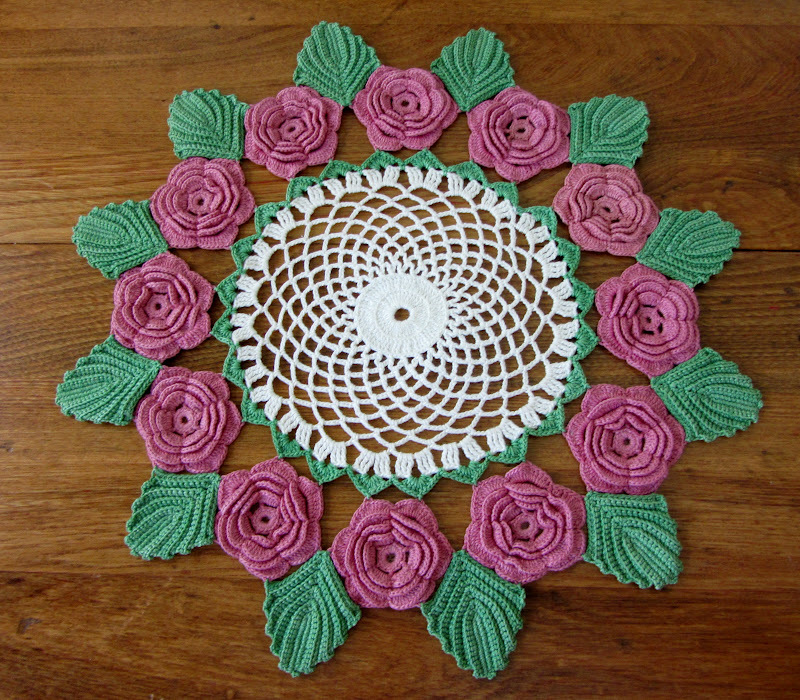 I love doilies, though I never have a place to use them where they won't get destroyed. My crochet skills have to come a LONG way before I'd be able to make one. Never seen such beautiful, colorful doilies as you show--thanks, I'll be on the look-out now. I might have to resort to framing them, with glass, to display them. I like the bread one! My favorite is the white one with the beading. Gorgeous! 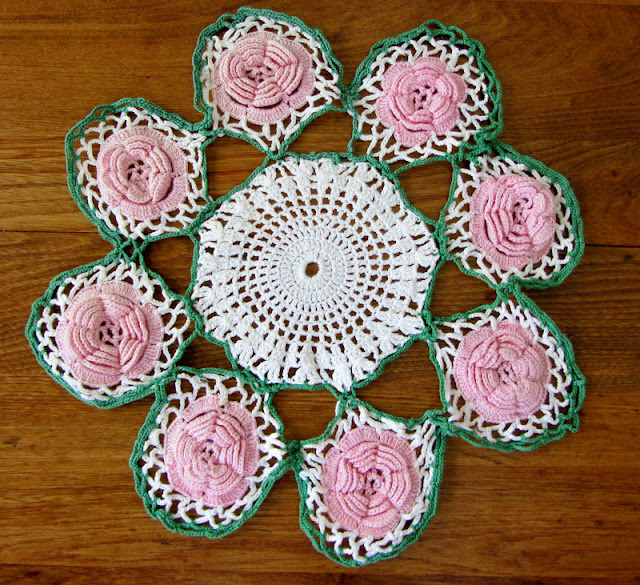 Just look at your awesome doilies! WOW! I love every single solitary one of them! I don't think I have ever seen such intricate doilies-they are all so pretty! I have always had a soft spot in my heart for them! 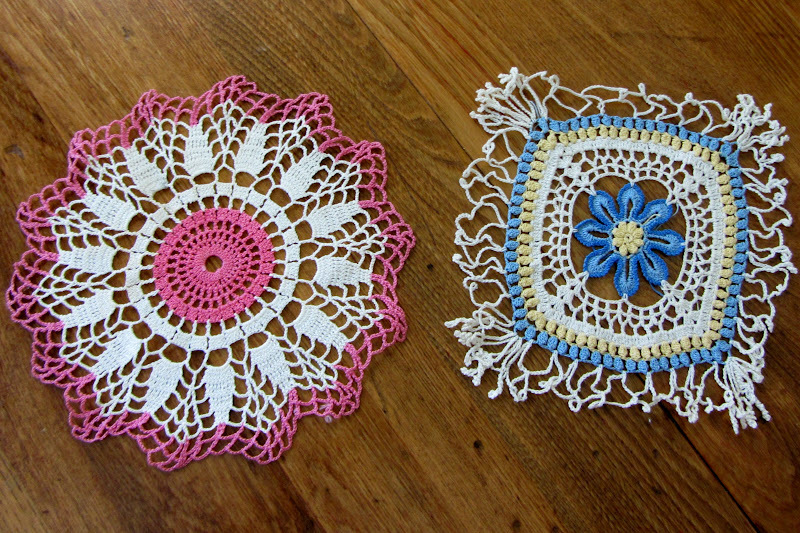 Since I love shabby chic and old things, I love doilies. As a crocheter, I appreciate the workmanship and time it took to make these. 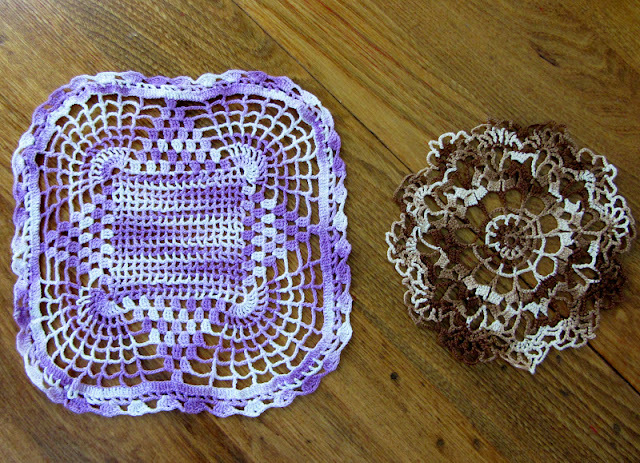 I've crocheted with thread before, but have never made a doily. Even if I did make one, I don't think I've have the patience for ones as intricate as these. Each of yours are works of art. I especially like the second one with the red flowers. Thanks for sharing these little treasures in your home at my party Carlene. All so pretty! Love the one with the red roses!! I've crocheted a few in my time, but nothing EVER as amazing as these lovelies in your collection. They are simply STUNNING! Thanks so much for sharing this! Found you through Cozy Home Scenes - hope you'll come by for a visit! I love them all> I wish i could crochet with that small threat only yarn for me .Thanks for sharing Joann Come and follow me back,lost my followers this week. What a lovely collection of doilies. My favorites were the white with the red beading and somehow that colorful (kind of psychadelic) one. I can almost visualize it tacked with (removable) stitches to some kind of a throw pillow. Every single one in your collection is too pretty to be stashed away unseen. Imagine all of the combined hours of work that went into the creation of them. Come to think of it, they are actually pieces of art.